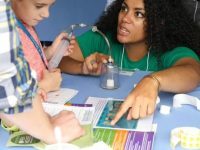 This annual celebration consists of talks by Lamont’s world-renowned experts as well as dozens of hands-on activities and experiments for kids to learn about how our planet works. The award from the New York State Department of Transportation recognizes Lamont’s electric shuttle buses, bike-friendly engineering, and more. 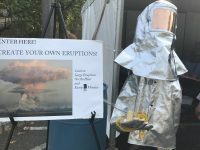 To find out if this harmful metal is lingering in your backyard or local park, and to learn how to protect your family, bring a few scoops of soil to the Lamont-Doherty Open House on October 13. 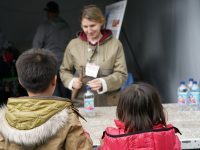 Through interactive exhibits, games, goo, and a few explosions, people of all ages learned about geology, earth science, and climate change. 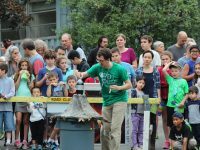 The annual Open House promises a day of science-filled fun. 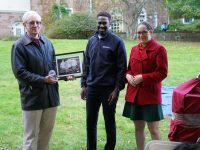 Nearly 3,000 people showed up to explore the Lamont-Doherty Earth Observatory’s campus and laboratories at the open house on Oct. 8. Watch the video and find out what it was all about. 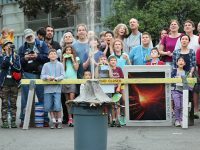 Thousands of visitors toured the labs and crowded around demonstrations at Lamont-Doherty Earth Observatory’s Open House on Saturday, often jumping in to help. Visitors to Lamont-Doherty Earth Observatory’s open house on Oct. 11 could tune in to a performance of “Salty Folk” by Superhero Clubhouse, a collective of artists and environmental advocates. Created by Jeremy Pickard and Nate Weida, the play uses music and humor to illustrate the history and importance of New York Harbor through the “eyes” of five oysters: Brook, Manny, Bronxy, Queeny and Stats. “Field Trip: A Climate Cabaret,” at the Lamont Doherty Earth Observatory Open House on Oct. 6, will use song and dance to focus on the research of prominent female scientists. Whether you are interested in global poverty alleviation, sustainable development, sustainability management, ecology or environmental policy, Columbia University has a program for you. 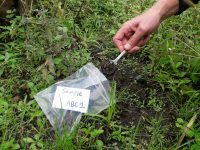 Attend the Environmental and Sustainable Development Programs Open House from 4-7 p.m. on Monday, Oct. 24, Low Memorial Library, Columbia University (116th & Broadway) to learn more.